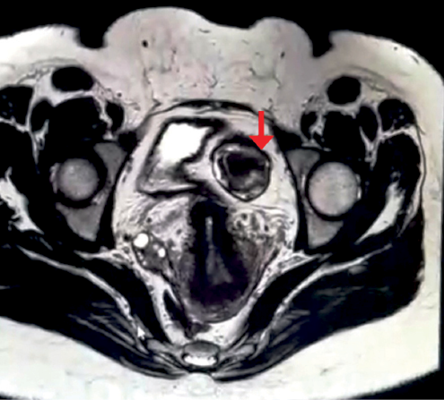 Figure 1: Cross section magnetic resonance image of the pelvis showing adnexal cyst (red arrow). A 39-year-old unmarried woman was referred for evaluation following an incidental ultrasound finding of a 5 × 4 cm pelvic cyst with a thick hyperechoic wall. Otherwise, her gynecological, medical, and surgical history was unremarkable. Her clinical examination was unremarkable. She was mildly obese with a body mass index of 32. There was no abdominal tenderness or palpable masses. Bimanual vaginal examination was not performed (as is the custom in Muslim countries for unmarried women). Tumor markers cancer antigen (CA)-125, human chorionic gonadotropin, lactate dehydrogenase, and alpha-feto-protein were all negative. Magnetic resonance imaging (MRI) of the pelvis showed a normal uterus and endometrium [Figure 1]. Both ovaries were normal. There was a well-defined, irregular pelvic mass lesion, measuring 4.5 × 3.8 × 3.5 cm compressing the bladder dome, but not arising from it. It was of mixed signal intensity on T2-weighted images and was of relatively thick hypointense wall, could represent hemosiderin or calcification. There was a small amount of fluid in the solid mass that was not enhancing on postcontrast examination. There was no ascites or pelvic lymph node enlargement. The MRI concluded that it was a pelvic mass, with no clear attachment to any of the pelvic organs. The most likely possible differential diagnoses were: urachal cyst, degenerated pedunculated subserous fibroid, peritoneal inclusion cyst, and ovarian dermoid cyst. 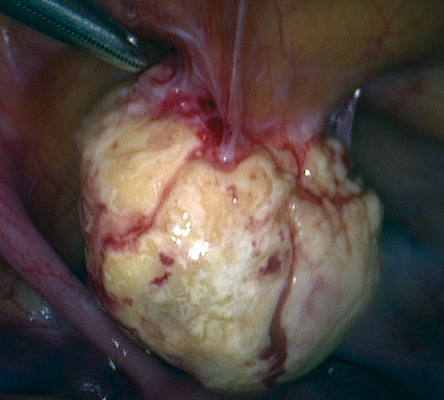 Figure 2: Laparoscopic image of the cyst intraoperatively. The authors thank the patient and her family for cooperation in the matter of this publication. 1. Moyle PL, Kataoka MY, Nakai A, Takahata A, Reinhold C, Sala E. Nonovarian cystic lesions of the pelvis. Radiographics 2010 Jul-Aug;30(4):921-938. 2. Gowri V, Al Shukri M, Al Khaduri M, Machado L. Clinical and Histological Profile of Surgically Managed Benign Adnexal Masses. Oman Med J 2014;29(3):239-241. 3. Shetty MK. Adnexal Masses: Role of Supplemental Imaging with Magnetic Resonance Imaging. Seminars in Ultrasound, CT and MRI. 2016; 36(4): 369-384. 4. Arraiza Sarasa M, Ghai S, Metser U, Kennedy E, Vajpeyi R. A practical approach to cystic peritoneal masses and neoplasms: pearls and tips. Educational Exhibit. Congress ECR 2013:C-2522. 5. Levy AD, Arnáiz J, Shaw JC, Sobin LH. From the archives of the AFIP: primary peritoneal tumors: imaging features with pathologic correlation. Radiographics 2008 Mar-Apr;28(2):583-607, quiz 621-622. 6. Ashish P. Wasnik, Katherine E. Maturen, Ravi K. Kaza, Mahmoud M. Al-Hawary, Isaac R. Francis. Primary and secondary disease of the peritoneum and mesentery: review of anatomy and imaging features. Abdominal Imaging 2015; 40(3): 626-642. 7. Balaguera JC, Tórres SO, Almenta MM, Carneros VJ, Segovia JC, Gamarra LP, et al. Cystic Pathology Of The Abdominal Wall After Laparotomy: A Three-Case Report. The Internet Journal of Surgery 2005; 8(1). 8. Dickerson EC, Alam HB, Brown RK, Stojanovska J, Collaborative MR, Davenport MS. In-Person Communication Between Radiologists and Acute Care Surgeons Leads to Significant Alterations in Surgical Decision Making. J Am Coll Radiol 2016; 13(8):943-949.